Meetings are important procedures for any company, team or unit, be it a sports team, a business team, a school teachers’ team or any such unit. Company team meetings are a place where ideas and plans are shared, shortcomings are discussed, solutions are found, where strategies are planned etc. In brief, a meeting is where the past and current team activities of the company are discussed and planned to build the future of the company. It is when running an effective meeting mostly when a team meets and each team member shares his or her opinion about the success or failure of a certain project and steps are taken to ensure that the success is repeated in a higher magnitude while the failures are not. Thus work meetings are essential for the success of any business or team. But it is also seen that many prefer to stay away from meeting activities while some do not like to attend one. The reasons can be many. The following mentioned are few meeting tips on how to make meetings fun and few best company meeting ideas. 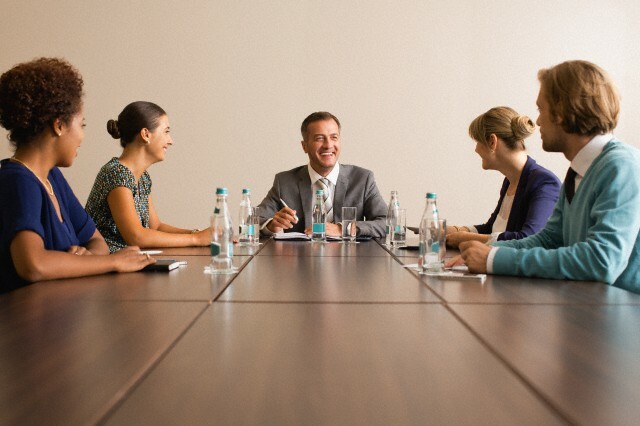 Yet, meetings are necessary and crucial for any team’s success but it is up to each of you as to how you help make the meeting more productive and team friendly. You can make meetings creative and dynamic by following certain tips. Yes, the purpose of the meeting. If you just want to wish each other and say nothing and leave, then why hold a meeting and waste everybody’s time? Fix the agenda of the effective team meetings and state in clear terms whys and what’s about the meeting. Also inform the team as to what is expected of them in the meeting, that is, if they have to bring with them past reports, their targets, reports of their achievements, their grievances, etc. While you fix an agenda for the meeting, make sure that you are not dealing with too many points. If it is a sales meeting, just focus on the target set and the difficulties and achievements. Set small but realistic agenda for the meeting and thereafter. You may want to achieve too much in a short period of time but realize that this is not practical. Set achievable target and agenda and that is the core to the success of any meeting. An efficient meeting should have a prescribed time limit. Fix a time period for the meeting, an hour, two hours or three. Of course, there are full day meetings, two or three day meetings and so on. Anyway, fix the time. Start the meeting on time and try to end it on time. Also do take a break after two hours or so, so that no one is feeling bored. Breaks help rejuvenate all. The invitees of a meeting will depend on what the topic of the meeting is. Once the invitations to the meeting are sent out, ensure that all those invited will be present for the meeting. A meeting’s success depends on whether all the necessary points are discussed and all issues are resolved. If people who are crucial to the meeting stay away or remain absent, there is no point in taking the meeting forward. A meeting will be a success on when each one present has something to contribute to the meeting. Do not encourage passive members, who will only listen and won’t speak out. Remember, the result of the meeting and the subsequent after-effects of it will depend on what each member had to put forward. Certain rules are necessary for the success of any meeting. First, let no phones be brought in. There is no need to check phone updates or emails during a meeting. Those who think they have urgent matters to be checked on the phone can wait for the break. Punctuality is a must. There is no way anyone can enter late for the meeting. Everybody has to be on their chairs at least 10 minutes before the commencement of the meeting. They can utilize this time to keep their papers ready and their thoughts, questions and suggestions handy. Let a person take down the important notes of the meeting like the plans discussed, the strategies planned, what each one had to offer, suggestions, team meeting ideas, plan of action and of course, the new targets and the action to be taken. Make proper minutes of the meeting and let each member get a copy of it, so that they know what their duties are now on and how to go about. The success of their action can be discussed in the next meeting. Let each member be assigned a task and give him or her a deadline to achieve the same. Follow ups with the member can be done periodically. So, by the time the next meeting takes place, each member is ready with his or her report card. Take a review of the last meeting held. It will help you to discuss early strategies and if you need to change any or bring in new plans. Let meetings strictly stick to the agenda and the points therein. Gossips and complaints about one another can wait for another meeting. Not all would like to work on Sundays keeping files and notes ready for a Monday meeting. Tuesdays are better. On Monday, they can do their homework and keep things ready for a meeting the next day. A meeting is a meeting, and you decide what kind of meeting would be more productive, a face to face one or a virtual meeting or a phone conference. A little refreshment will do no harm to the meeting. In fact, it will help all be more rejuvenated, active, alert and enthused. Rude behavior from any member will help only to bring the morale down. So ensure that everyone is professional, polite and will speak on turns only. This will help in boosting up employee morale and confidence. While being polite is a necessity, so is the need for a healthy debate. Let each one share their difficulties and point of view with regard to assignments and targets or any agenda of the team meeting activities. It is important to discuss and share obstacles and opinions, only then you can ensure that the meeting is a productive one. Diplomacy does not work for a meeting’ success. When something works out, everybody wants to take the credit for it and if something does not, then all want to blame one another for the debacle. In such a scenario, let the blame game begin but at a professional level. Sometimes, such a talk will really help plug loopholes. Some kind words and notes of appreciation can do work wonders for a team. So let praises flow without any recession. Give credit where it is due. So you are at the meeting to discuss a professional subject, yet, don’t make the atmosphere too tight and formal. Let there be an informality in the formal meeting so that everyone is relaxed and can put forward their opinions and points without fear, anxiety and guilt. A meeting is not the last word in a team, in fact, such meetings do happen at periodic intervals. Let these meetings be learning points. So let there be a facilitator for the meeting and not someone who will judge the process and just point out mistakes. Though a slide show might work for longer meetings, it is really not needed for short meetings. Rather than having a slide show, discuss each point instead. It will make a meeting more interesting and productive. 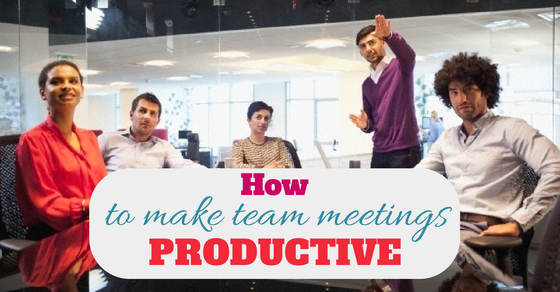 You might wonder what it has to do with the productivity of a meeting. It does. Ensure that there are comfortable chairs to sit on, the table is good enough and the space is not crammed. These are small things but add a lot to the success of a meeting. Sometimes have the meeting outside the office, so that there is a freshness rather than always meeting up in the conference or meeting rooms. A slight change in venue will also refresh and lift up moods. 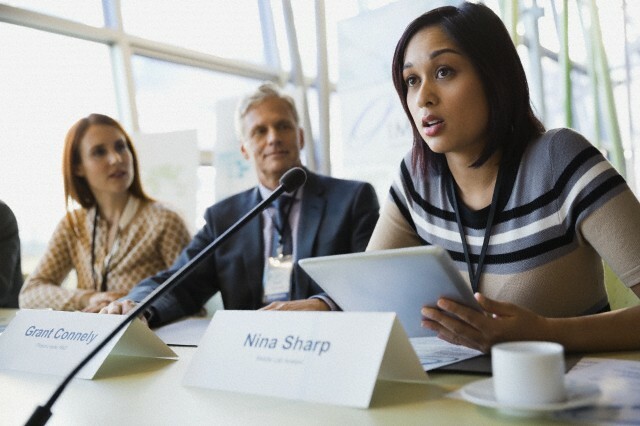 Once the meeting is over, you can ask each member to give a feedback about the meeting as to what is that they liked or disliked and what can be done to make such meetings more productive. Each one can send in their feedback by mail and these points can be considered at the next meeting. Set the last 15 minutes or so to analyze how the meeting went. This will help to put the next meeting in better order. The points will also serve as a reminder as to what to keep ready for the next meeting. Since you have the minutes of the meeting ready with you, ensure that those who were assigned different targets are working to the best of their ability. Regular follow up will not only keep each on their toes but it will also help them work to their full potential, thus ensuring the productivity of the meeting and reaching the purpose of it.